Residents of Migron are furious as the Prime Minister ignores their plight on the eve of demolition. Migron: remains of razed home. Israelis living in the Binyamin-region community of Migron, north of Jerusalem, have expressed anger at Prime Minister Binyamin Netanyahu’s failure to intervene as they appeal the pending destruction of their homes. Residents accused Netanyahu of abandoning them to the whims of the State Attorney’s Office. They were angered by warnings that if they fight their eviction, they may not get alternative homes. “The Prime Minister would do well to uphold the basic rights of purchase and trade, rather than to engage in psychological warfare against Migron residents,” they said. 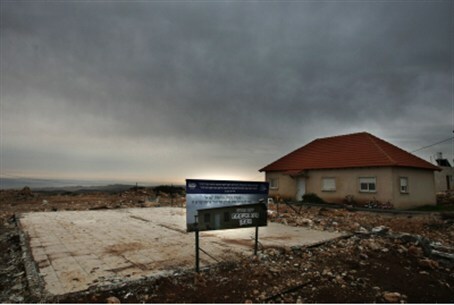 Residents have appealed the initial demolition order, handed down after PA Arabs challenged the sale of Migron’s land to Jews, based on a second land purchase deal in which the land was bought from several of those who now claim ownership. The army and police are planning to evict residents of Migron by next Tuesday. IDF Coordinator of Government Activities in Judea and Samaria Major-General Eitan Dangot recently sent a letter warning residents that if troops must use force to evict them, the government will no longer see itself obligated to develop a new permanent neighborhood for them in the nearby Hayekev site. In the meantime, the Givat Hayekev site is facing a legal challenge from Palestinian Authority Arabs, who say they, not Migron residents, should be given new homes.